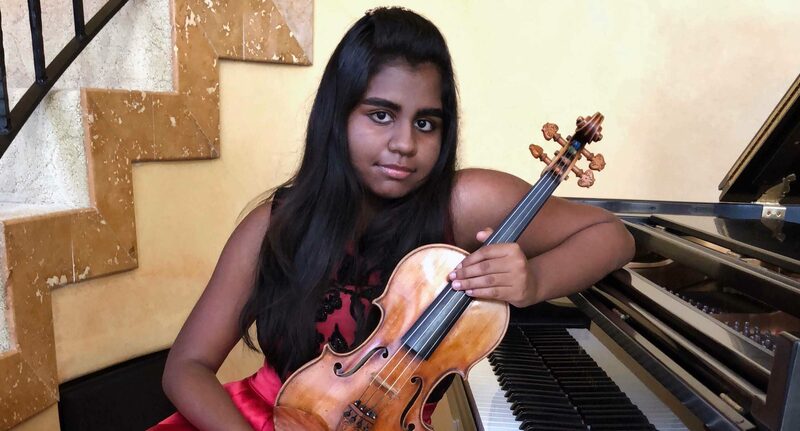 Apsara Kasiraman, 14, studies piano with Rina Dokshitsky, violin with Henry Gronnier, composition with Michael McLean, orchestral conducting with Maxim Eshkenazy, and music theory with Kathy Sawada. She is a native of Agoura Hills, CA and has been a Community School student for nine years. This interview has been edited for style, content, and clarity. How did you first start taking lessons here? I used to study piano with a local teacher, and my parents thought I outgrew her. They read about Colburn in the LA Times, so they came here to get a professional opinion on what to do with me. I auditioned in 2010, as a five year old, and started taking piano and music theory at Colburn. I started violin lessons with another local teacher and when I outgrew that teacher, I switched to Colburn again. What do you think of Colburn? I love it. It is my second home. I really love the sense of community created by both the teachers and my peers. I also like that there isn’t unhealthy competition here. Everybody is really supportive of each other. I really want to thank all my teachers, peers, other faculty, and staff here at Colburn for making this such an amazing place. I’ve learned so much and it’s such a positive environment. I’m really grateful for that. What’s it like playing both violin and piano? There’s a lot you can learn from both instruments in parallel. They’re very connected, in a way. For example, phrasing is a universal concept, and learning how to phrase on the violin has really helped me create lyrical lines on the piano. Although the piano and violin are very different, both of them have helped me with technique and musical expression on the other instrument. Balancing both instruments does get challenging at times, but it’s not arduous because I enjoy doing it. Knowing the piano and a string instrument has really helped me not only as an instrumentalist, but as a composer too. Many ensembles have string instruments. The piano is unlike any other instrument, as it has both string-like and percussive qualities, and being proficient at it has been truly helpful. What made you decide to start playing violin as your second instrument? My family and I were in Italy one summer, and my parents took me to a concert where they played Vivaldi’s The Four Seasons. That experience really inspired to take up the violin. I begged my parents for a year, and they put me in lessons. I officially started taking composition lessons in fifth grade. I was composing in my free time before that and my mom found out that Colburn had composition teachers. She got in contact with them. I had an audition here and started taking lessons. The reason I wanted to compose is that I had so many ideas in my head and I didn’t know what to do with them, so I started writing them down. I wanted some guidance with it too, because as much as composing independently was nice, I felt I really needed someone to guide me in the right direction and expose me to more music. It depends on what I’m writing. If I’m doing an assignment that has strict guidelines, I’ll try to follow those guidelines as much as possible. If I’m just writing freely, I take an idea and put it on the page, and then add more ideas on the page and arrange them around as needed. And then it just turns into a piece, I guess. There isn’t really a set process that I use. I just follow whatever comes to my mind. The way I write is very different for each individual composition. What made you decide to do the LA Phil’s Nancy and Barry Sanders Composer Fellowship Program? About half a decade ago, I went to a Toyota Symphonies for Youth concert with the LA Phil where they featured works by high schoolers in the program. Even then, I had a pretty clear idea that I wanted to be a composer someday. I discovered the program quite early, but I was definitely too young for it. After I started taking composition lessons at Colburn, I still kept that in the back of my mind. This year, I was finally eligible for it, so I applied because I felt that it was an amazing learning opportunity. What are you learning from it? I’m definitely being exposed to a lot of different styles of music, especially contemporary works that I hadn’t been exposed to before. I’m also meeting a lot of great composers, and learning from my peers too, which is invaluable. What kind of pieces do you usually write? Other than the assigned ones, I love writing for full orchestra because one can take it in so many different directions. There are so many different colors and textures that you can create. Generally, I have a very specific sound in my mind before I write a part down. Every instrument has its own unique sound to it, and I try to see which instrument best matches the sound I have in my mind. Then, I will write the line for that instrument. Sometimes, I also use the same process on a larger scale to create a certain atmosphere. Music, to me, is a way of conveying one’s emotions and sharing your experiences with the world. Music is also a really powerful way of sharing memories with others non-verbally. What do you want to do with your music in the future? Not only do I want to be a composer, but I also want to be a conductor. For college, I would like to go to a university. I want to major in music and something else, as I have a lot of academic interests. I’m not sure what that other thing would be, but it’s either math, a scientific field, or arts leadership. Do you plan to keep playing your instruments? Of course. I wouldn’t let go of that. It may be hard for me to make a career as an instrumentalist, like Hilary Hahn, but I definitely want to keep playing my instruments. In a sense, I want to be like Leonard Bernstein. Although he was known as a composer and conductor, people say that he could have become a concert pianist any day. I love math, science, travel, and being outdoors. It is very fascinating to me how math and science embody abstraction and simplicity at the same time, just like music. I love to travel because I can learn so much about different places, cultures, and people. When I’m not practicing, composing, or doing homework, one can find me skiing, hiking, or just being outdoors.